Added by Marc Russinoff on September 16, 2018. 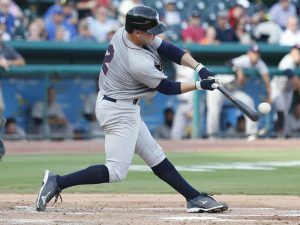 ​York, PA- The Somerset Patriots (37-26, 72-54) lost 6-1 to the York Revolution (35-28, 67-59) on the final day of the 2018 regular season at PeoplesBank Park on Sunday afternoon. Somerset started the scoring in the bottom of the fourth when NJ native Scott Kelly smacked an RBI double to make it 1-0. However, that was the only offense the Patriots would get. York responded with three runs in the bottom of the fourth, coming on one swing of the bat. Alonzo Harris sent a towering ball over the wall in left field to propel the Revolution in front 3-1. The Revolution added three more runs in the bottom of the eighth to finish the scoring. Jailen Peguero (3-5) picked up the win with a scoreless inning of relief with two strikeouts and two walks. Rick Teasley (4-5) took the loss, giving up three earned runs over 4.2 IP with one walk and five strikeouts. The 2018 Somerset Patriots Season presented by Ford will continue on the road for the remainder of the regular season before returning to TD Bank Ballpark for Game 3 of the Liberty Division Championship Series on Friday, September 21st at 7:05 pm. The game includes Post Game Fireworks. For tickets, visit www.somersetpatriots.com.